The Indian cosmetics market is currently worth $6.5 billion and is expected to grow to $35 billion by 2035, a recent survey-based study has concluded. As the popular myth goes, sales of cosmetics skyrocketed in the 90s thanks to the hype generated from Miss World crowns landing on Indian heads. A lesser-known fact is that the liberalisation of the economy in 1991 had a lot to do with this. Following India opening up to the free market, foreign products flooded the markets. Creams, deodorants and gels, we wanted them all. By the early 2000s, the Indian government decided that some regulation was necessary. Thankfully, there are a few researchers in the country who were keeping a watch. One of them is Sanju Nanda, Professor of Cosmetics at Department of Pharmaceutical Sciences at Maharshi Dayanand University, Rohtak in Haryana. “2013 was a significant year for Indian cosmetics,’’ Sanju said in an interview at her office earlier this year. Pressured by agencies like PETA and Humane Society International a ban on animal testing was issued and the Indian Drugs and Cosmetics Act was updated. India became the first South Asian country to join the leagues of the European Union and leaving the US behind to ban animal testing, both in domestic manufacture and imports of cosmetic products. “This was the time when the government realised that since India joined the World Trade Organisation, several Asian countries had started dumping a lot of cosmetics into India. There were too many products and their quality was not clear. In 2013, registration was made compulsory for all cosmetic products imported to India,’’ Sanju said. The same year, Sanju was invited to Osong, South Korea, to meet international cosmetic traders and communicate to them India’s firm new stance on cosmetics. “I was given the first slot of fifty minutes at the Symposium of Asian Cosmetic Development to talk about the changes in the regulatory scenario of cosmetics in India,’’ she said proudly. A monograph she wrote as a part of consumer education series on behalf of Ministry of Consumer Affairs in 2006 named ‘Cosmetics and Consumers’ supported her through this important responsibility. ‘‘The book is like badam ki giri (almonds); it has everything nutritious in high concentration. Its still useful for me in conferences to motivate students to take up cosmetics research,’’ she said presenting the tiny book priced at Rs 20. Since then the Indian markets have been showing signs of maturing. Market trends suggest that Indians like herbal cosmetics more; the sales of herbal cosmetics has been growing 12% every year. Sanju and her team of young researchers also favor herbal cosmetics. “We attempt to keep our research in parallel with the regulation of Indian standards as well as the FDA (US). We also like catering to Indian choices, skin types and indigenous sources,’’ Sanju said introducing her team of young researchers. As a pharmacy student, Sanju took up research in enhancing a drug’s effect by physical means through the skin. She experimented with electricity-assisted drug delivery through the skin for her M.Pharm project at Sagar University in Madhya Pradesh. In 1991, she started her PhD work on a similar area at IIT Delhi, this time trying ultrasound to enhance drug delivery through the skin. Giving her company as pharmacy teacher, was Arun Nanda, her husband. In 1998, the couple moved to Rohtak, Sanju’s birthplace, to be part of the founding team of the Department of Pharmaceutical Sciences at MDU. “I was the only female over here. I had three male colleagues, including my husband. In the years that it took to establish the department, I had to teach subjects which were not my specialisation (cosmetics was one of them) and do whatever job was given to me – like inviting guests for conferences, office tasks, buying curtains, sorting arguments between students and taking care of the women’s cell. In 2006, we got more faculty members. Finally, we are now growing.’’ Today the department has seventeen faculty member. Sanju believes there is a lot more work to be done in this field, especially since many cosmetics fall in a huge grey area and these products often overlooked. Only in 1964 Amendment was the word Cosmetics added to the Indian Drugs And Cosmetics Act 1940. “Cosmetics need to get the same kind of attention and quality check as drugs since cosmetics also stay in contact with the skin for long hours. Cosmetics are meant for beautification by definition on one side while the consumers are emotionally exploited on the other side by misleading claims and advertisements. Cosmetic products are loaded with many such chemicals which may be harmful for the users and not disclosed in the label. Ethically designed cosmetics are the need of the hour,’’ Sanju appeals. 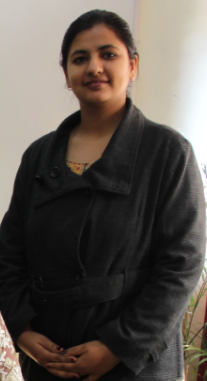 Today Sanju considers herself fortunate to take the research forward with many lab hours put in by her all-female team of full-time research fellows: Kumud Madan, Sapna Saini and Sheeffali Mahant. All of them have been lecturers at colleges and universities in Haryana. But to go further in their research life, they must first finish their PhDs. They are the next generation that Sanju has inspired. 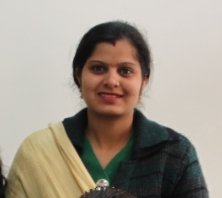 Sheefali, Sanju’s newest fellow is working on an anti-acne formulation with indigenous essential oils. The name of the oil neither Sanju or Sheefali will reveal. ‘‘This project has a novelty which we have to protect’’, they explained. “Currently the products in the market either contain antibiotics and chemicals that are very irritating to the skin. They cause excessive dryness and itchiness. With antibiotics, there is the high possibility of bacteria developing resistance and the formulation becoming ineffective after some time. 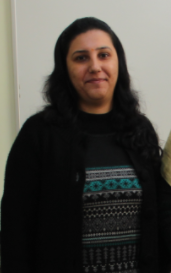 The aim of my dissertation is to design and develop a formulation which is devoid of these drawbacks,’’ Sheefali said. Besides high-end instrumentation, what the women scientists at MDU Rohtak are also lacking is the feeling of safety. “In Punjab University and IIT, girls can work late because they live in hostels on campus. None of us are put up in the hostel so we can’t take that risk,” Kumud weighed in. Kumud and Sapna have families with children who they cannot leave behind to live in a hostel. Sheefali is lucky to have a relative in Rohtak who she stays with. Sapna, who is mother to two said: ‘have you watched ki and kaa?’ when questioned her lab-family balance. She was referring to the Bollywood film where husband and wife gladly exchange household and career chores counterintuitive to societies expectations. “I belong to a village in Haryana where people don’t send their girls to science, they prefer arts or something else. Science takes time and tuition are required. They don’t want to give so much time and money. I was lucky because of my uncle who owned a school and pushed for me to study higher when he saw I was the school topper,’’ she said. Sapna’s husband, also a pharmacy graduate is currently attempting to get through the same department in which his wife works. At the condition of not being named the three scholars shared a few more experiences. “The society is still reluctant to promote higher studies for women,’’ they said. Sometimes science comes in the way of marriage and not the other way round. “Families of suitors are too very concerned with the girl’s income. If you say you are a researcher with a scholarship, they don’t think too highly of that. They think ‘if our son is earning at least 10 lakh per annum, then the girl should at least earn 6 lakh,’’ they said. “We have many relatives who say: Kitna padhe gee? Itna padhkar kya hoga? Budhe ho jate hai, Chashme lag jaate hai. Kya milta hai? (How much will you study? You will grow old and spectacled and what will you get in the end?) Society has still not warmed up to science for women,” they concluded.